Family run restaurant, the owner Mustat is one of the nicest guys in the Gumusluk village. 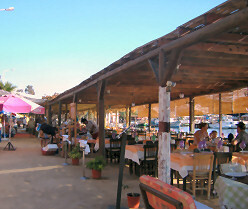 The beach restaurant does good value for money food; they serve a variety of meals ranging from Pizza to Fresh Fish. Situated next to the Beach Restaurant, this restaurant serves excellent food with chefs that have worked at five star hotels in Istanbul. Gusta serves a wide range of food that will delight your taste buds although it has a price to match but well worth the extra money. 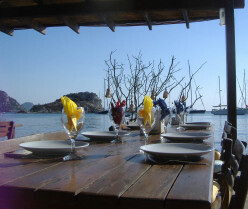 Situated in the Gumusluk harbor amongst the main fish restaurants, this restaurant does excellent fresh fish and the price is comparable with any of the other restaurants in this area. This Bar is excellent during high season (Mid July to the end of August). Its situated at the far end of the bay. Sit around the camp fire on bean bags or take in the atmosphere around the circular bar. Good music and friendly staff. Nice Bar situated near to the Dolmus station. Smiley the owner will give you a real Turkish welcome! He looks like a Turkish Richard Gear or so he thinks! Good bar to chill out or play backgammon in during the day. Wireless available here.